Why should I switch from Cordwood to Wood Bricks? Convenience: Cordwood requires too much work. Typically, cords of wood are dumped on your lawn or driveway. Then the moving, stacking (and sometimes splitting) follows. Even more time and effort is added if you have to season your logs before use. 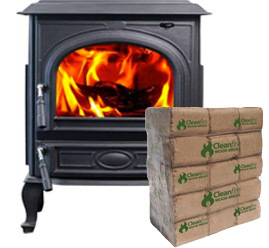 Cleanfire Wood Bricks on the other hand come packaged in shrink-wrapped bundles (15 bricks per bundle), on a one-ton pallet. You may store them right on the pallet, or move these stackable bundles inside your garage or basement. Cleanliness: Not only are biomass bricks environmentally clean, but also clean for your home. 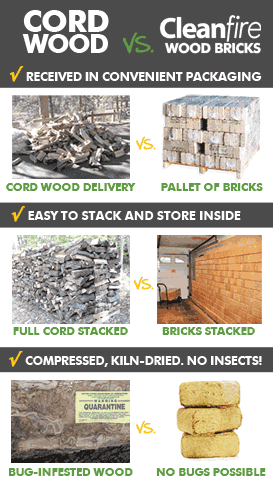 Unlike cordwood, which can have up to 20% bark, high levels of mold, and unwanted insects; Cleanfire Wood Bricks are bark-free, mold-free, and bug-free. Wood chips and sawdust are the only components in the kiln-fired bricks, which means there is no chance for insects to make homes in them. Consistency: Even with the more expensive kiln-dried or pre-seasoned cord wood, burn time and heat output can vary due to size and wood type/age inconsistencies. Compressed wood bricks are dried and pressed in a mold, making a uniform shape that has consistent burn times. Cordwood has many variables (seasoned vs. non-seasoned, wood type, size, kiln-dried vs non-kiln-dried, etc.) so the BTU level can be unreliable. Furthermore, in order to burn properly, wood should be between 15 and 20 percent moisture. To achieve this level of moisture, at least a summer of proper storage will be needed to dry out. 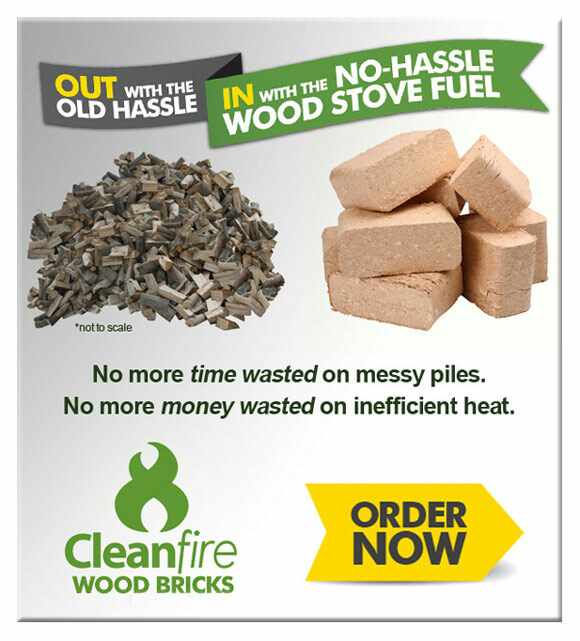 Cleanfire Wood Bricks burn at up to 8000 BTU/lb – much more efficient than air dried cord wood which typically burns at 6500 BTU/lb. Also, the bricks are dried to less than 10% moisture before they are packaged and delivered! Efficiency: Wood bricks are manufactured to release as much heat as possible when they burn. When anything burns, the energy is released as heat and light. Compared to cordwood, bricks release much more of their energy as heat vs. light, maximizing the BTU’s being generated per pound. Cord wood will sometimes generate larger and brighter visible flames, but the energy used to make those bright flames is wasted when it comes to heating. Many first time customers are surprised at just how much heat will be coming off a burning brick when they are used to seeing the larger flames that cord wood generates. 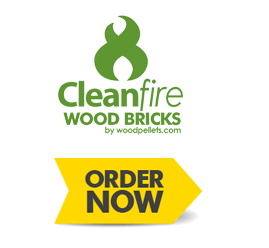 Cleanfire Wood Bricks are sold exclusively by Woodpellets.com! Call 1-800-735-5387 to speak to an expert, or buy wood bricks online.